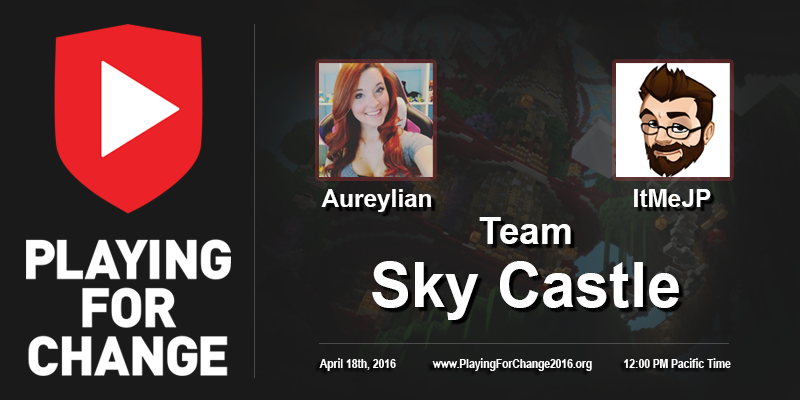 Games for Change & GameChanger Charity are excited to announce Playing for Change, a Minecraft UHC live-stream event! 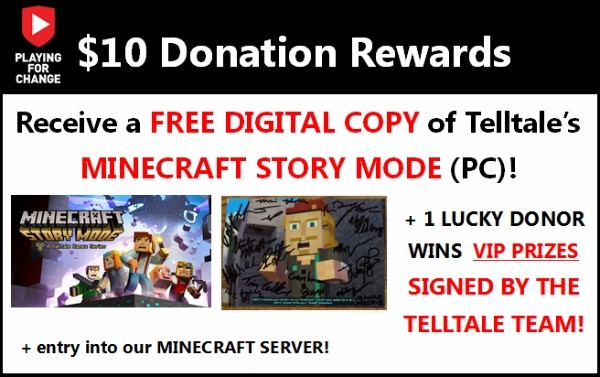 The UHC Event is over, but you can still donate for prizes through April 20th! Playing for Change will take place on April 18th, featuring CaptainSparklez, Syndicate and 24 streamers competing in a Minecraft UHC Charity Stream hosted live at Games for Change’s Games and Media Summit in New York City! Donations & Rewards: Get involved NOW and receive awesome rewards! 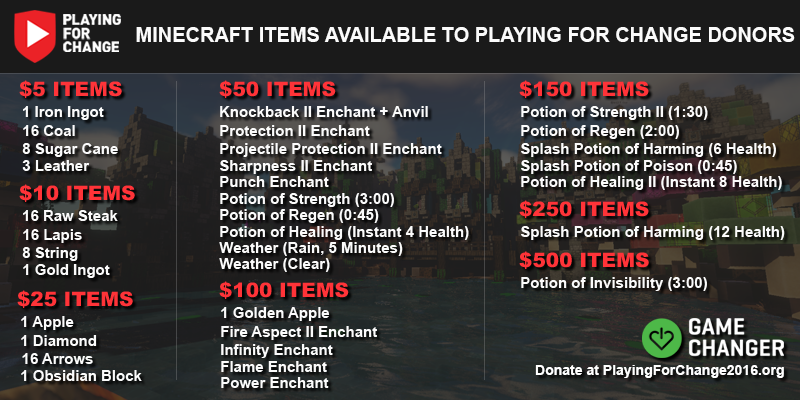 Donate $5 to play Minecraft mini-games on our custom server, or click here to check out the full list of prizes. 4/18 UHC - Event Details: Syndicate, CaptainSparklez and 20 top gaming stars will form teams to face off in a Minecraft UHC event, a popular Minecraft mod where the last character/team standing wins. Viewers watching the live-broadcast on Twitch/YouTube can donate to send Minecraft in-game items to their favorite players and help lead them to victory! Click here to learn more. 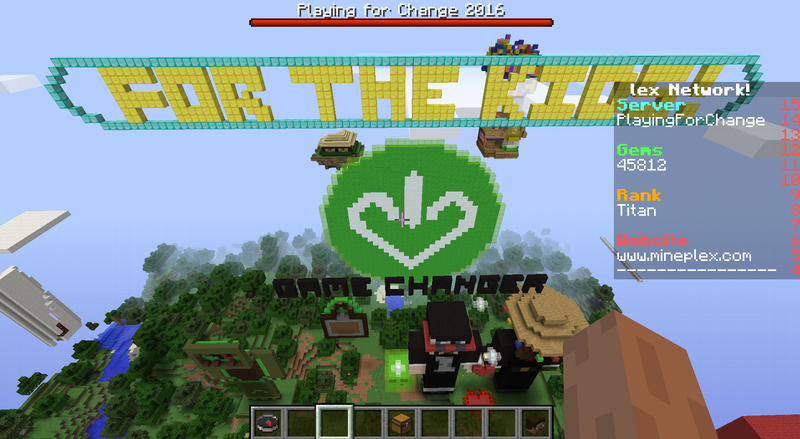 Check out the amazing Minecrafters & streamers in Playing for Change! Syndicate, CaptainSparklez's and 24 streamers will face off in a Minecraft UHC event, a popular Minecraft mod where the last character/team standing wins. Viewers watching the live-broadcast on Twitch can donate to send Minecraft in-game items to their favorite players and help lead them to victory! Prizes, Giveaways & Donor Incentives!! Starting NOW and through the main event on April 18th, donors will be able to join the Playing For Change Mineplex server, win amazing prizes, receive digital game codes and more! Prizes & winners subject to Official Terms & Conditions. Playing For Change Prize Drawing! 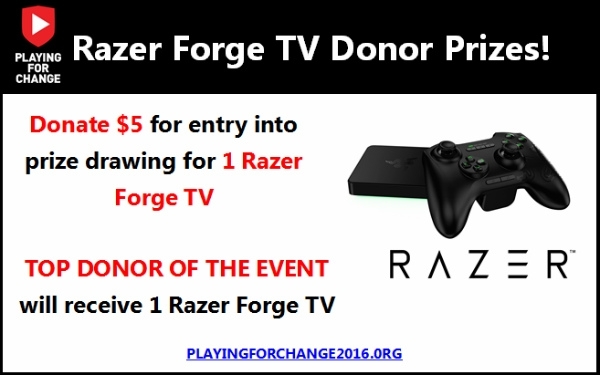 - Donate $5 to be entered into the GRAND PRIZE drawing and receive access to GameChanger's Minecraft server! - Save the date for the UHC Championship - Monday April 18th at 12 PM PT! - Watch the live-stream event on April 18th & influence gameplay by donating in-game items to help your favorite Minecrafters win! - Spread the word & tell your friends! - Don't own Minecraft yet? Click below to purchase a copy & get ready to play! 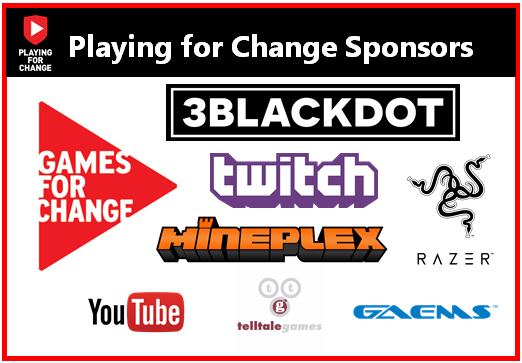 HUGE SHOUT OUT to Games for Change, 3BlackDot, Razer, Mineplex, Telltale and all Playing for Change event sponsors! Playing for Change wouldn't be possible without the generous contributions from our Sponsors, Streamers, Donors and Supporters.....THANK YOU! LIVE from the Games and Media Summit at the Tribeca Film Festival! Playing for Change is hosted in partnership with the Games and Media Summit, and will feature live-broadcasts from the summit in New York City on April 18th! Your Donations, Making an Impact! All funds raised will support GameChanger Charity's mission of improving the lives of children with cancer through gaming! Donations will be made directly to GameChanger Charity, a nonprofit tax-exempt organization. Click here to learn more about about GameChanger, or visit gamechangercharity.org. If you have any questions or concerns about the campaign, please send an email to GameChanger at support@gamechangercharity.org. Please be sure to read the Official Terms & Conditions for the rules around donation incentives, availability to international donors and expected delivery of any rewards/prizes. 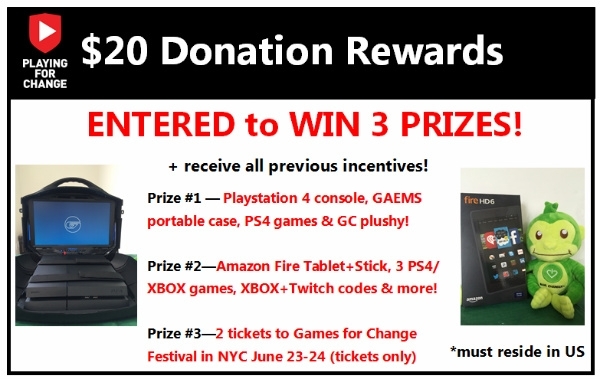 OFFICIAL TERMS & CONDITION FOR SWEEPSTAKES/PRIZES/GIVEAWAYS - All donations will be processed & given to GameChanger Charity, a 501c3 registered nonprofit organization (IRS Tax ID: 26-3438815). Funds will be collected via GameChanger’s software platform “Donor Drive”, and deposited directly into accounts controlled by GameChanger after successful processing by merchant providers.The intent of this event is to generate fundraising & awareness for GameChanger’s mission to improve the lives of children with life-threatening illnesses. 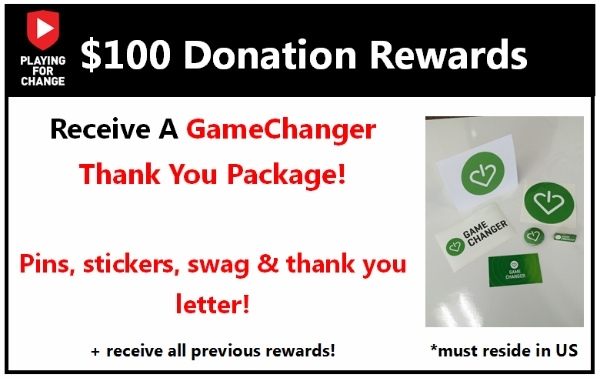 REWARDS/PRIZES/PROMOTIONS: To help promote the event & GameChanger’s fundraising efforts, the charity’s donation page will offer several incentives, rewards & opportunities for donors/event supporters to receive a digital/physical prize. Donations are accepted from all countries starting April 6th until April 22nd. Digital incentives & prizes are available to all donors from any country. Donors from any country can join the Minecraft server for Playing for Change, but must already previously own a copy of Minecraft. ATTENTION INTERNATIONAL DONORS - Some donor prizes/rewards may include a physical item that must be delivered in the mail - any prize requiring postage is restricted & only available to donors in the United States. Physical rewards to donors may take up to 4-6 weeks to be delivered in the mail. Any questions or concerns, please contact info@gamechangercharity.org or call 949-661-3000. Subject to full terms available at: Playing for Change Official Rules. NO PURCHASE OR CONTRIBUTION NECESSARY TO ENTER OR WIN. Void where prohibited or restricted by law. Sweepstakes is offered only in the (50) U.S. to legal residents of the U.S. who are currently physically residing in the U.S., and are 13 years of age or older at time of entry. Ends 11:59 p.m. PT on 4/22/16 unless noted otherwise. To enter without making a contribution, print out the Entry Form and follow the instructions. Mail-in requests must be postmarked no later than 4/18/16, and received no later than 6:00 pm PT on 4/22/16. Winners will be notified by 5/5/16. If donors wish to contribute but do not wish to be entered, they can type out a donation comment to remove themselves from the entry. Limit (5) entries total, per person, regardless of overall Contribution amount (if applicable), or method of entry. Odds of winning depend on the number of eligible entries received. Subject to complete Official Rules.